Clouds are fascinating features in the sky and they come in different forms and shapes. 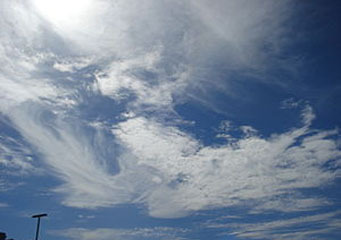 Clouds are categorized as low level clouds, middle level clouds and high level clouds. But not all clouds belong to any of these categories, such as accessory clouds. To learn more about this type of cloud, continue reading. Accessory cloud refers to a small cloud structure attached or close to any of the major cloud systems. It depends on the larger cloud structure for its growth and existence. Accessory cloud rarely sets off its own rainfall but the parent cloud does, and oftentimes, rainfall produced by the parent cloud is confused to be from the accessory cloud. Accessory clouds are classified into three, namely, velum, pannus and pileus. Let us examine each one of them. Velum is a Latin word that means awning or sail. This cloud resembles a long, white, or grey veil either above or around huge convection clouds. Velum clouds are commonly seen with cumulonimbus or cumulus congestus clouds. They often spread out in extremely large areas. If velum is not around prior to the development of the convection clouds within it, velum will have the crest of cumulus clouds spread out till it reaches the stable air layer above. When bigger cumulus clouds finally break out via stable air layer, velum hangs around for a while. This type of accessory cloud is characterized by dark piles of low level clouds emerging in saturated air below the parent rain clouds. These dark clouds may contain a layer which can be alienated from the primary part of the parent cloud or attached to it. Pannus accessory cloud is widely seen with rain clouds such as cumulonimbus, nimbostratus and cumulus. It is also called the messenger cloud because within five minutes of its appearance, heavy rains will occur. Pileus, often referred to as scarf or cap cloud, is characterized by a small horizontal cap that exists shortly on top of a parent cloud that divides it. You can even see pileus accessory cloud developing on top of each other. Pileus develops when stable air current is lifted as a result of the rising cloud underneath. They are often seen on top of cumulonimbus calvus or cumulus congestus clouds, and highly regarded by cloud enthusiasts because they never linger for long periods of time. This is an arch cloud characterized by low, horizontal formation connected to the foremost edge of thunderstorm outflow. Arcus cloud is further classified into shelf clouds and roll clouds. Shelf clouds are horizontal, low-level, resembling a wedge-shaped structure. Tornadoes seldom occur in this type of arcus cloud. Roll clouds, on the other hand, are tube-shaped arcus clouds fully separated from the base of a cumulonimbus. Just like shelf clouds, they rarely create tornadoes. Incus cloud is seen on the top part of cumulonimbus cloud branching out as ice crystals awning, taking the shape of anvils. Incus clouds are high level accessory clouds. Mammatus clouds are so named because of they resemble the shape of a woman’s breasts. Pouched-shape clouds hanging under a parent cloud, mammatus clouds develop as negatively floating moisture overloaded air basin. These clouds are commonly seen in extreme storms, though they are also visible even in mild storms. The most striking sightings of mammatus clouds are on the base of large cumulonimbus anvils that can cover up the visible sky. This particular cloud type is seen as a needle like or cone-shaped extension of a main base cloud that results from a rotating column of wind. However, it is not a tornado provided that its circulation doesn’t reach the ground. Knowing the different classifications and features of accessory clouds not only strengthens your fascination of the different cloud types, but also aids you in knowing the weather conditions that come with each one.